When the sun begins to finally peek out from behind the clouds during the spring season, the prices at the pump also jump--and often significantly. The reasons for this jump in gas prices include increased demand as drivers get out to enjoy the warm weather, routine maintenance at oil refineries and the switch to summer formulations at those refineries. As the week began, the national average for a gallon of gas was $3.55 per gallon, according to AAA's Fuel Gauge Report. The average cost for fuel is up by three cents a gallon from the week before, but has jumped by 10 cents from just a month earlier. 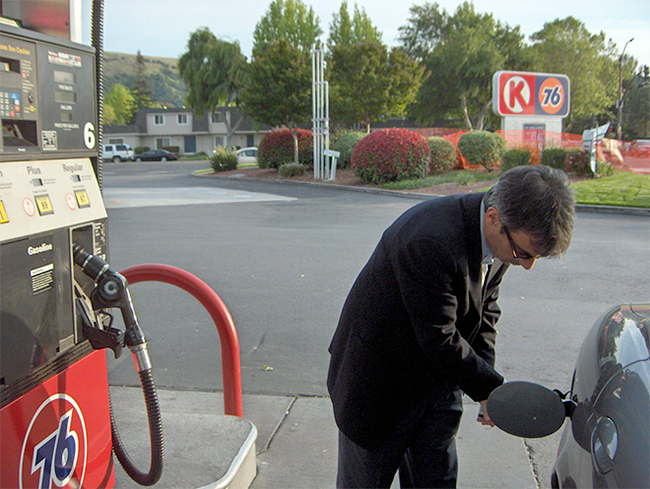 When prices rise at the pump, many consumers find themselves searching for ways to save. Here, we'll offer three simple ways you can begin saving on your fuel costs right away. Although driving less may sound like a really silly and overly simplistic approach, finding alternatives to driving can not only save you money, but also can improve your health. According to the Food Research and Action Center, more than two-thirds of all adults in the United States are classified as either overweight or obese. Many employers are committed to help their workforce get into better shape via wellness programs and via incentivizing cycling-to-work programs. Public transportation is a great option for commuters in large or very busy areas, which still helps your wallet... and your body. There's really no way to get better gas mileage than to operate a hybrid or fully electric vehicle. The best-selling hybrid is the Toyota Prius, which boasts 50 miles per gallon combined. But hybrids do not fully eliminate trips to the gas pump; they harness the power of electricity and gas, alternating seamlessly depending on factors like speed and distance. Want to never stop for gas again? Opt, then, for the first fully electric vehicle--the Nissan Leaf. The Leaf uses the same electric outlet you'd use for other household appliances, and surprisingly needs only about seven hours to reach a full charge. Further, Nissan estimates the cost of a full charge is $2.40 (based on current national averages for electricity). Not everyone can change their car immediately, but everyone can change their driving habits. It's no secret that accelerating slower, driving slower and using defensive driving can really save you money at the pump. The principles and techniques for this type of driving can be learned in a defensive driving course. Taking a Texas defensive driving course helps participants identify common distractions, modify behaviors and attitudes behind the wheel and implement safer driving techniques. They say everything is bigger in Texas, and those who complete a Texas defensive driving class often find their stress levels fall while the dollars in their wallets increase. The best part--these benefits of defensive driving can start today.